Everyone and everything needs a number. Not, however for identification purposes. Getting to the ubiquitous “next level”. All of those require detailed measurements. Which means you guessed it, we need to establish a number. But Marshall, numbers are sooooooo boring. Measuring stuff is hard because that means we have to stop for a moment and gather data. Can’t we talk about making more money instead? Keeping track of some sort of number in every facet of your shop is how you know if you are on the right track or not. For example, what’s the relative humidity in your screen room right now? Do you know that number? Financially, how many customers are more than thirty days past due on your Accounts Receivable report? Cash flow is king, so you better be tracking that. That could be a shop killer number. What’s the average stitch count for any job in your embroidery department? How many minutes does it take on average to set up a screen when printing? There are plenty of things you should be tracking with numbers in your shop. Measuring. Adjusting. Asking, is this a good number? What can we do to improve the number? Yet sadly, not enough shops are looking at their numbers. They are head down, just blindly churning out work. At the end of the week, month or quarter that’s when the puzzled looks and head scratching starts. I’ll bet by now you can guess what I’m going to say. Yep. You aren’t looking at the right numbers. Every shop is different, but the one thing that connects them is that numbers can paint a true story of their success or journey. Let’s take your shop for example. What is your biggest challenge? Sales? Quality? Production scheduling? Profit? It really doesn’t matter the issue. What you need to do is to establish a current snapshot of what’s going on now. Right this second, what’s the number for your biggest challenge? When work is slow, it feels like time stands still. Dump in a giant pile of orders, and it feels like we can’t keep up. Many production managers become overwhelmed and don’t even know where to start to try to determine how on earth they can build a predictable schedule. It is simply too difficult. Let’s break it into manageable chunks and see if we can distill a number that we can use. For starters, let’s jot down how many minutes we have available in one shift. For discussion’s sake, let’s say the shift is an eight hour day. That’s 480 minutes. If we subtract a 30-minute lunch and two 15-minute breaks, that leaves 420 minutes. 420 minutes seems like a lot. But is the shop producing orders every single minute of the day? How many setups do you do on average and how long do they take? Let’s say you do ten setups and they take ten minutes each. That’s 100 minutes not spent producing. So we are at 320 minutes. Does this mean the crew is working non-stop for that 320 minute time? So that’s the amount of time we have in minutes. What other number is relevant to understanding our shop’s production schedule? The amount of work produced. Regardless of the decoration method, we can call those impressions. A shirt produced with a front and back image will equal two impressions. Checking over your production machines history, we can easily get an average number of impressions produced per day. 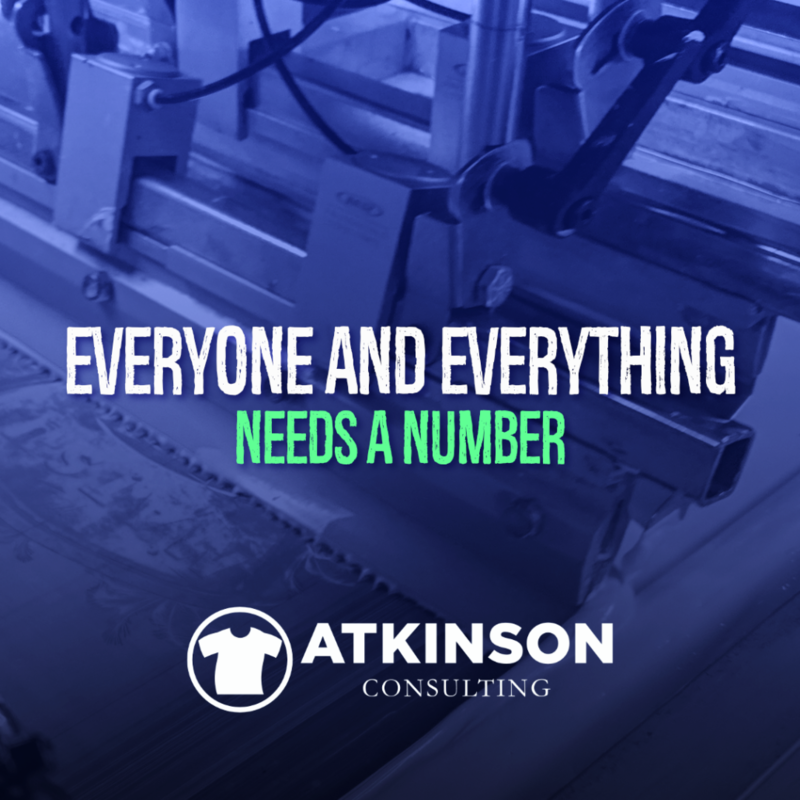 We don’t have to know the number of ink colors, stitches, locations, or types of shirts. This is just an overview. For the sake of this article, let’s say that the average total number of work produced (impressions) per day for the shop is 1,800 per machine. Some days are higher. A few days are lower. But 1,800 is the average. This is neither good nor bad, it is what it is. Still with me? Good. Go get a cookie. You deserve it! So, if we take 275 and divide by 60 (minutes), that equals 4.58 hours. That means the shop actually only decorates shirts 4.58 hours out of the 8 hours scheduled. Our production impression average of 1,800 per day per machine means that if we divide that by 4.58 hours we know that our average decoration speed is 393 impressions per hour. Can shops run faster than 393? You bet. But let’s just use that number for a moment. So what would be the high range if we didn’t stop for the entire day? 420 minutes equals 7 hours. 7 times 393 is 2,751. So now we know that with not even trying to do anything about our downtime or making any efficiency changes that our daily production range should be between 1,800 and 2,751 impressions per day. But what if we start tweaking the numbers with improvements? 393 shirts per hour equal 6.55 per minute. What if we can get that to 7 shirts per minute? That’s only a slight improvement, right? That’s 420 shirts per hour. If we multiply that with our original 4.58 hours, that would equal 1,923 shirts at the end of the day. Which means that yes, a half second’s worth of extra effort can nail another 123 shirts. That’s probably one order. But what happens if you don’t measure this stuff? You are probably the shop owner that just paid a crew to work all day and they printed 823 impressions. Because nobody is looking at this stuff and asking them for more. Here’s where I make you throw up in your mouth. 823 divided by 4.58 means that your shop runs at about 180 impressions per hour. Take 1,800 and work five days a week, and that will equal 9,000 impressions per week produced. The 9,000 impressions per week rate expressed monthly would be 36,000. Annually, that comes out to 432,000 impressions. Take 824 and work five days a week, and that will equal 4,120 impressions per week produced. The 4,120 impressions per week rate expressed monthly would be 16,480. Annually, that comes out to 197,760 impressions. That’s a 234,240 impression difference. Folks, this is why we keep track of this stuff. You can’t be satisfied with underperforming production. So hopefully by now you haven’t clicked over and started watching cat vs cucumber video memes on Facebook. If you have, email me when you want to sell your shop so I can line up a broker for you. I gotta guy. If you are still here, let’s use that info. And let’s pretend you aren’t the 824 shop. If we have a baseline number of 1,800 impressions per day, then we know about what to expect when we bring in orders to produce. I don’t expect you to refuse work, but you have to adjust to what’s coming in. The day after the job is sold, schedule that job out to the equipment you are going to run the job. You want to use the real ship date. For sake of discussion, let’s say it has to ship on the 30th. Ideally, you want to have the job completely finished and ready for shipping on the 29th, which is one business day before. Therefore your job is to determine how long you need to run that order. Using your system software, a calendar, or even a whiteboard…you can then schedule the order on the correct day. Extending work hours. This means overtime. Moving another scheduled order out to create room. Outsourcing the work to someone else. Every day at noon, pull a report of your shop’s schedule on what needs to be completed tomorrow. Is everything ready to go? Art approved, embroidery files digitized, screens burned, and inventory received? But if something is hanging, that order gets automatically moved to another day. Then, make a list and prioritize the work. Use this order to arrange the jobs: Rush, Late, Today, Tomorrow. Anything that is a rush or critical “has to go” job gets worked on first. Then, stage all late jobs. After that, any order that is slated for today. Then, and only then, start on orders that are out a few days in the future. With your prioritized schedule in hand, round up everything needed. Remember, you are doing this every afternoon for work to be started on in the morning. Find it all. Line it up in order by the machine. Right next to it. This should be in the same priority order as your written schedule, and this becomes your shop standard in how to stage your floor. Do this every day. Rinse and repeat. On Friday’s do this for Monday. If you are working on a Saturday to get ahead or make up some lost time, pull the jobs for Saturday on Friday. Then, on Saturday, pull the jobs for Monday. This is not hard to do as a task. What is difficult is the mindset shift to do it every day. It’s the measuring that makes this work. You need to see the difference between what you assign and what gets accomplished. Keep track of how long things take. When you start improving things, then your numbers change. For example, you saw what happens when your results go from 6.55 shirts printed per minute to 7 shirts per minute. That’s 393 per hour to 420 per hour. At ten shirts a minute, that’s 600 shirts per hour. Extrapolating some numbers at the 4.58 hours worked rate, that would be 2,748 impressions per day, 13,740 per week, 54,960 per month, and 659,520 impressions annually. Think of the impact that moving from 6.55 shirts printed per minute to 10 shirts printed per minute could have. What would you need to do to get there? Trust me, it won’t happen all at once. There are plenty of roadblocks in your way, including the people that are doing the work. A good way to find out what you need is to simply ask. Brainstorm on techniques, methods, training, equipment, consumables, or anything needed that will give you the edge. Again, this only happens if you are measuring as you need to know where you came from before you can look ahead to changing something. Then try something. It’s that testing that pushes things forward. Can you make it a goal to get from 6.55 shirts per minute to 7.2 shirts per minute? Then go to 8.3? Maybe one day to 10? Document what it took. Dig in and change something else. It’s that ongoing improvement that makes us masters of what we do. I really could go on and on regarding using numbers to quantify things in your shop. Hopefully, by now you get the idea. One thing that absolutely works best is to measure and then establish your baseline number. This is where you are now. This could be oriented around a person, for example with attendance. Do they have perfect attendance? If not, where do they fit in? Where should the line be drawn? What about screen tension? Are you measuring that? If so, what’s your minimum tension level that is acceptable before you stop using that screen? It could revolve around sales. Do you have a yearly goal you are trying to hit? Can you back that down to a Quarterly, Monthly, Weekly and Daily sales goal? Let’s say you want your sales to increase by another $500,000 this year. That’s a goal of $125,000 per Quarter. $41,666 per Month. $10,416 per Week. And $2,083 per day. Therefore, what are you doing to capture an extra $2,000 in sales every day? Establish your goal, and then work backward to determine how to achieve it. 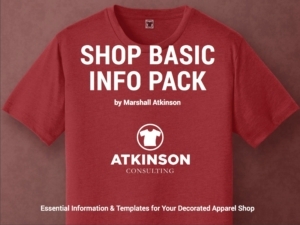 My eBook, “Shop Basic Info Pack” contains help in four areas of your shop. There is a Business Plan template, a section on Branding, an Employee Handbook template…but for numbers, there is a Production Log Dashboard system that allows you to measure and track your screenprinting production. This is a very valuable tool that you can use to help understand your downtime rate, set up times, run times and impressions production speed. There is a simple daily form, and you take the totals from that form and add them to the Dashboard. It’s easy.